How do I enter a K-1 with multiple states? Federal information. Enter all federal K-1 amounts in the Federal column. Enter the first state being filed in the ST field at the top of the screen. Enter amounts in the State column only for that state and only if they differ from the federal amounts. Complete data entry. Enter all necessary information on all tabs of the K1 screen (at the top of the screen). When the first K1 screen with federal and the first state is complete, press page down to open a new K1 screen for the second state. On the new K1 screen, enter the next state at the top in the ST field. 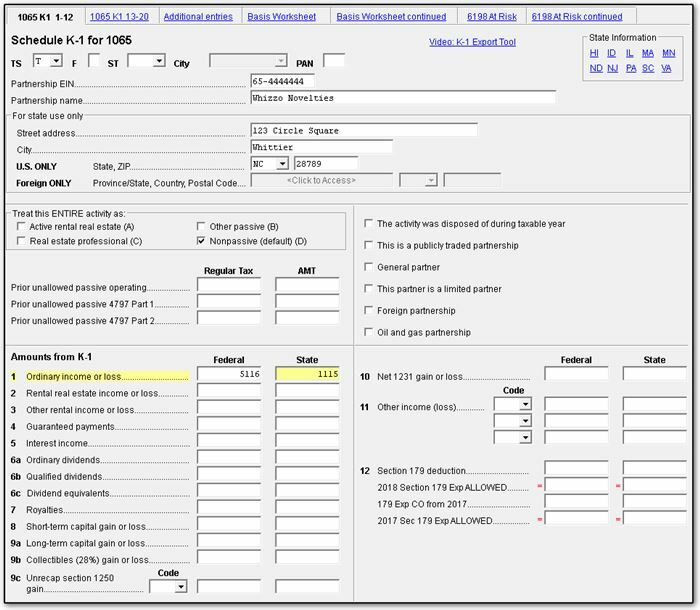 Enter a zero (0) in the F field to suppress the information on the federal return. Complete all applicable fields on all tabs. Basic information, such as ID number and name, must be re-entered. Because the program does not use the entries on this screen for federal purposes, it is not necessary to enter the federal amounts, but all applicable state amounts are required, even if they are identical to the federal amounts entered on the first screen. For each additional state included on the K-1, repeat step 2 above. Important: It may be necessary to add the state abbreviation or other identifying notation at the beginning or end of the business name as many states require selection of the corresponding federal K-1 on the state specific K-1 data entry screen. Some state K-1 selection screens may require manual adjustment to the K-1s name after selection to allow the state to pickup the different K-1s.